The Menopause: RRP £3.99 A simple guide to the peri-menopause, menopause & life beyond the menopause. 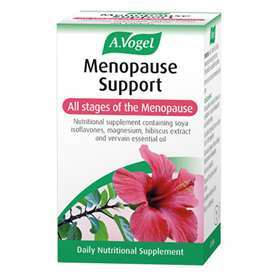 A.Vogel Menopause Support Tablets is a nutritional supplement containing soya isoflavones, magnesium, hibiscus extract and vervain essential oil to help provide a daily nutritional supplement during all stages of the menopause. for all stages of the menopause. Take 1 tablet twice daily (morning and evening) with food. Each tablet contains 405mg of tri-magnesium dicitrate anhydrous, 42mg of soy bean extract (60% isoflavones), 35mg Hibiscus extract and 0.25mg Vervain essential oil. Also contains microcrystalline cellulose, Beta vulgaris (beetroot juice) powder and magnesium stearate (Vegetable source). 2 tablets provides 30% of adult NRV.